Taste of Home Magazine Just $6.25 A Year + FREE Digital Subscription (Reg. $24 Cover Price)! You are here: Home / Great Deals / Taste of Home Magazine Just $6.25 A Year + FREE Digital Subscription (Reg. $24 Cover Price)! Yay! I am ordering a subscription for myself right now since is the lowest price this magazine has been in awhile! 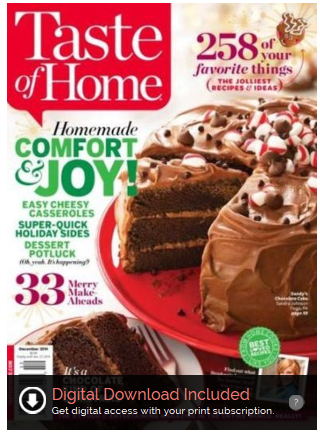 Today only, 12/26, we can snag Taste of Home Magazine for just $6.25 A Year + FREE Digital Subscription (Reg. $24 Cover Price)! Just use coupon code 29126 at checkout!